Straight to the Point – The DC Deck Building Game is a deceptively simple and innovative game, but so well presented it has the feel of a much more complex CCG. 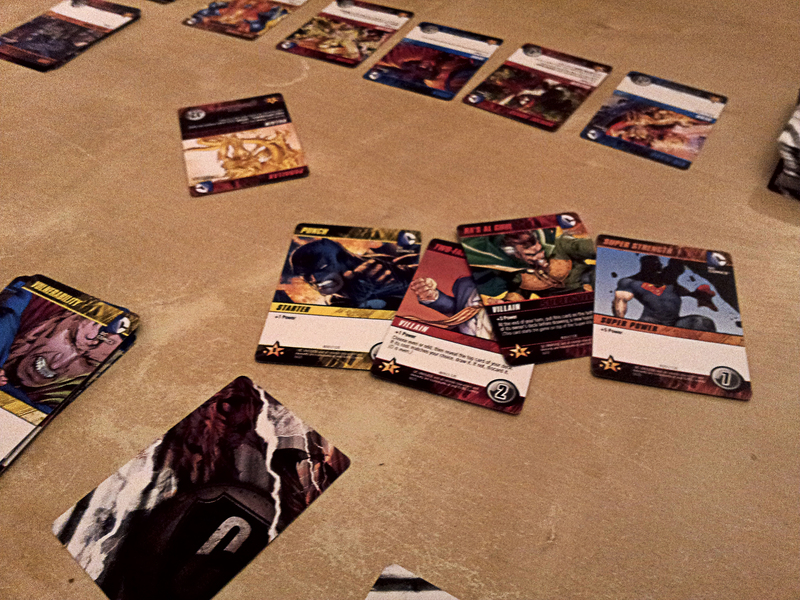 We took no time at all to choose our superheroes and get started on the game, but we took a while to go through the rules and get the hang of the system, as it seems more complicated than it actually is – possibly because we haven’t played a deck building game before. Players take turns spending power points based on the cards played from their hand, to add things like superpowers, equipment and villains to their own deck. It’s a bit like combining the MTG tournament card distribution with the actual game. Each turn you improve your deck, getting rid of vulnerabilities and weaknesses, and buying new powers and gear. You win the game by accruing victory points, mostly by defeating villains and super-villains. The cards themselves are well presented, using artwork from DC artists, and some directly from the comics. They are a bit basic, but very easy to understand, with clear numbering and concise text. It seemed a bit wrong for me, as Green Lantern, to be buying the Batmobile, or heat vision, but I eventually caved, and added some real power to my deck. The game doesn’t really play as a narrative; the villains you defeat are added to your deck, so you can play them later. The way I see it, when my Green Lantern played the Parallax card it was more him using the experience he gained in defeating the enemy, rather than actually summoning villains to fight for you. I’m not sure how we managed to make the game last 2 hours, but we weren’t rushing, and it was our first play through. I think we were a bit influenced by the cooperative feel of it: it’s easy to forget that you are competing on points, not cool gear, impressive deck or cards acquired. If we played again I think we would all go straight for villains and big point cards, focusing less on getting our themed character cards, and likely finish much quicker. I really liked the semi-cooperative feel of the game, the competition is about solo improvement, rather than direct attack or defence. Everyone seemed to really enjoy the game, and we are all excited to play again, though I think the game may run differently next time now we all know what to expect. With 8 of the 12 super-villains used in each game, it may have limited replays, but with so many cards in the main deck and so many possibilities I think it will be easy to enjoy playing over and over, and any expansions will be an added bonus, rather than an eventual necessity. So, in summary, I think DC Deck Building Game could be a new Munchkin or Chez Geek for our group – a nice fast paced game to start off an evening, maybe get the kids involved and get our brains in gear for the rest of the nights gaming. A well put together game with long term playability, and simple, engaging gameplay.